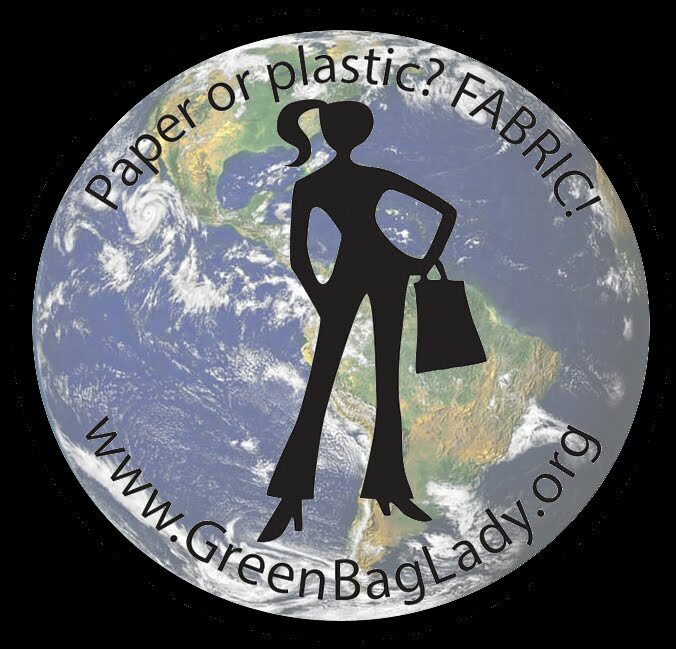 Green Bag Lady: Harmony Art Organic Cotton Freebie! 37 Winners! Harmony Art Organic Cotton Freebie! 37 Winners! It's that time of year again! Sew Mama Sew Giveaway Day (it's a week actually). It's super fun, tons of people participate by entering the giveaways or hosting a giveaway themselves. We have some great stuff for you today. 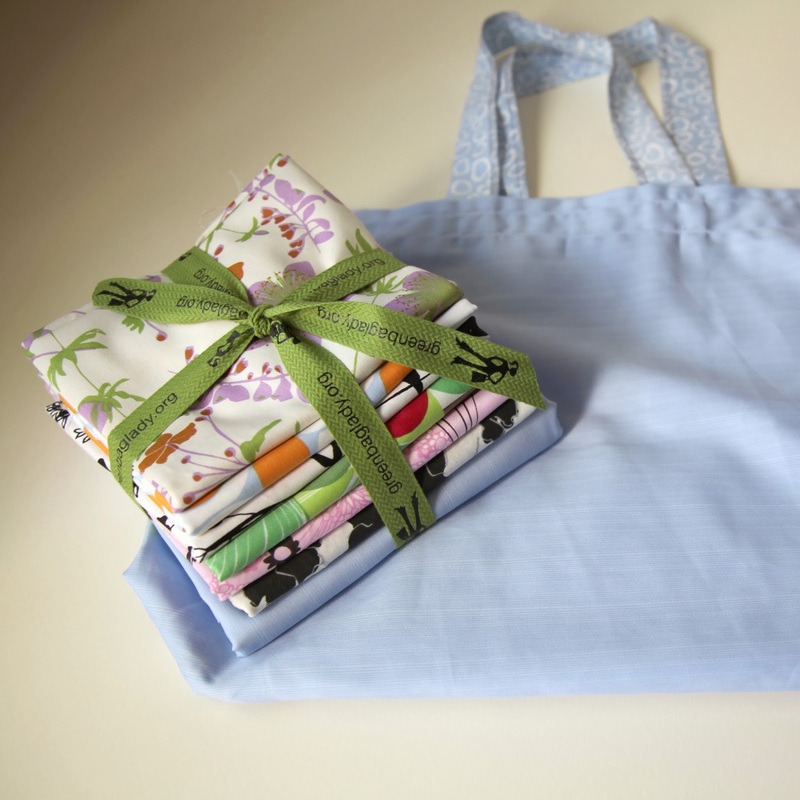 How about a Harmony Art organic cotton shopping bag? Super cute, fits in your purse and good for the environment in so many ways. We have 35 of these great bags to give away. Yes, 35!!! In your comment please tell us if you are USA/Canada, if you don't, we will assume you are international. We will randomly pick 35 lucky people to win shopping bags and 2 people (USA/Canada) to win the fabric stack/shopping bag combo! 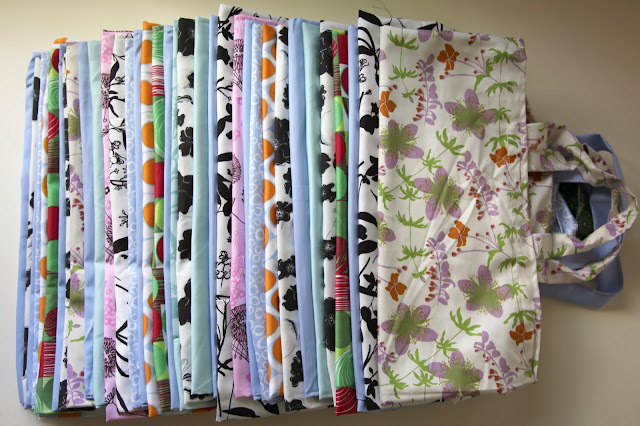 We will ship shopping bags internationally fabric stacks will only be shipped to the USA and Canada. You MUST use English for your comments. Do the best you can. Non-English comments will be removed. You are so generous- so many great bags -this looks like a pretty fabric pack too. I live in Edmonton Alberta Canada. Thanks for participating in this grand blog hop. This fabric is so pretty .Thanks for the chance. Great bags! I am in the USA. Wow, more bags! You guys are amazing, you keep going and going! lol Can you imagine how many plastic bags have been eliminated due to your work? WOW! Anyway, I am in Canada and want to thank you for yet another giveaway. I LOVE HARMONY ART FABRIC!!! Did I mention how much I love Harmony Art fabrics??? Beautiful bags. Style Teresa has become recognizable. Thank you for the next draw, I hope this time lucky!) And bags as always lovely, especially the black and white! I really wanted to please his wife a bag! Thank you! Very nice bag! Thank you!! Thanks for a fab giveaway. These really are wonderful bags. Very beautiful bag! Thank you! Love your bags!!! Yes I live in the USA. So pretty! Keep up the good work!! Thank you for another awesome give away! Looks like a good Christmas present! You do such a great thing for our planet! THank you! Rats. I am in the us. I forgot to add in my previous post. What a great giveaway! I would love to win! I'm in the USA. Oh, how lovely! Thank you! I had won one two years ago again in SewmamaSew giveaway and it is so useful. I'd love one more! ariadnesky (at) hotmail (dot) com AriadnefromGreece! I won one a few years ago and use it all the time. Would love to win another or, even better, fabric AND a bag. What a great giveaway and thanks for doing it. Also thanks for trying to make the world a little greener. I'm in Canada. Even here in Vancouver we are the Great White North today. It's snowing lightly. Thank you for such a generous giveaway,,,,sew4you57(at)gmail(dot)com in the USA. Hi! What a wonderful Giveaway, Thank you! 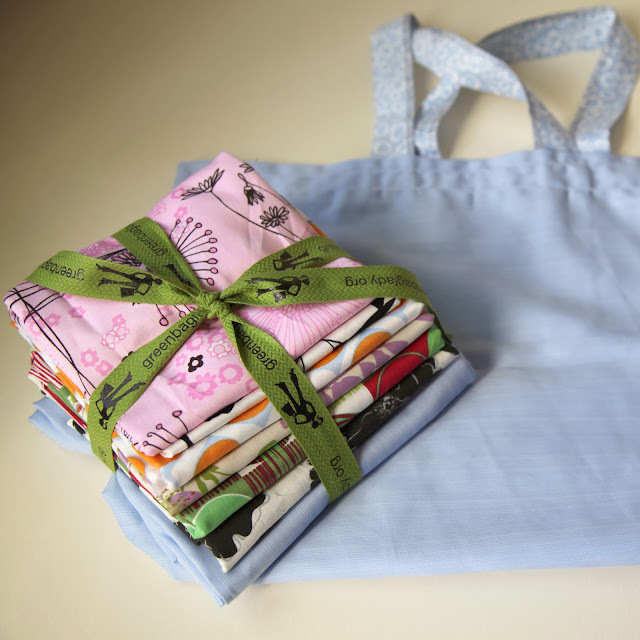 The bags are great and the fabric bundles wonderful! All Peace and Joy to you during this Holiday Season! I love your bags! I live in the USA. I am in the USA and thanks! Good ol' South Dakotan here! Thanks you for this lovely giveaway! These bags are lovely! Thanks for the chance! Thanks for the chance to win one these cute bags...one can never have enough of them! Thanks for the generous giveaway. I'm in the US. Gorgeous bags! Tks fr the chance! Cute bags and fabrics. Thanks for the chance to win. I live in the USA. I am in Utah U.S.A. Thank you for the chance to win. What a sweet, and very generous, giveaway! llatham0306(at)gmail(dot)com and I live in the USA! You are so generous with your bags. Thanks! mcglen8(at)gmail(dot)com from California. What a generous giveaway! I love the Harmony Art organics, especially the yummy sateens. Thank you! I love the Eco friendliness of this giveaway! Thanks for the opportunity. ptvandy15(at)hotmail(dot)com in the U.S. Thank you for a fantastic giveaway! That's a whole lotta lovely bags! I live in the US - thanks for the chance!! It would be wonderful to have one of these bags to carry in my purse! Thanks for the chance. I live in the USA. I'm Canadian, and would love a stack of fabric and a bag! Oh, this would be nice! Love the fabrics and the simple design of the bag. I live in the USA, in Sunny California. I live in the US. Thanks for the giveaway. Yay for freebies!!! Thank you for all that you do!! Beautiful fabric. Thanks for the giveaway and a chance to win! bwwedprep(at)yahoo(dot)com. I'm in the USA. What a generous giveaway! So many lucky winners from here! I live in the US. I hope I'm one of the lucky 37! Thanks for making all these bags so the world can save on using plastic bags. Wow! I live in the US, and this is such a generous giveaway! I live in Canada. You are very generous. What a great give away. Thanks for the chance to win. I love the fabrics! So pretty! Thanks so much for the chance - those bags look amazing!! And I'm in the USA (a very windy Chicago I might add). Awesome giveaway! I remember your giveaway specifically. while I didn't win I loved your generosity! I'm in Victoria BC. Amazing! THanks for the giveaway! What an awesome giveaway, thank you! carlakeahey(at)gmail(dot)com. I'm in the USA. 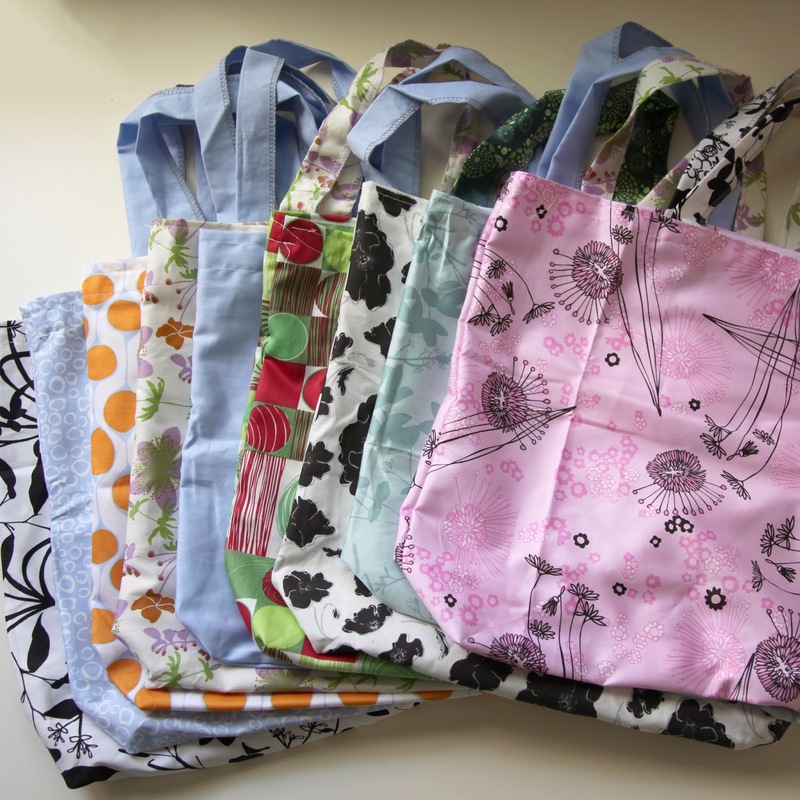 You can never have too many bags...or fabric! Thanks and I am in the US. Where I live (Tasmania, Australia) they have just made it a plastic-bag free zone so that means we all carry bags now! I'd love to stash one in my husbands coat pocket as he always forgets to take a bag! I hope I win the fabric and bag combo! Love your fabrics! Wow, another great giveaway! Lovely fabric too! I live in Canada. Thank you very much for the giveaway! Happy Holidays. Love the fabrics used in the bags. Beautiful shoppingbags! Too bad I cannot win the fabric stack, though.. Cool! I will be really happy to win one of them bags! Excellent and necessary bags, as always! I live in Louisiana, USA! Great fabrics for the bags. Can always use more. I'm in the USA. such pretty fabrics, that pink really jumped out at me. I'm in the US too. Great bags and pretty fabric! I'm in the USA. Emails is denny1600 at gmail dot com.